Being anxious or fearful of going to the dentist is very common, but modern dental practices are relatively pain-free, and dentists and dental staff are thoroughly trained in keeping patients calm and relaxed. At Comfy Dental Mandurah, we strive to make your dental experience comfortable by offering sedation dentistry. Conscious Sedation allows you to receive dental care without anxiety and discomfort. We offer different levels of sedation dentistry, each tailored to your unique requirements. No matter how nervous you feel at the thought of visiting your dentist, it’s best not to neglect your teeth due. This not only puts your oral health at risk, but it compromises your overall health. The beauty of conscious sedation is that it allows you to relax during your dental treatment and resume normal activities after your appointment. Inhalation sedation is best suited for cases of mild to moderate anxiety and is the most frequently used method. Nitrous oxide, or laughing gas, is the most commonly method used to sedate patients. It’s fast acting, makes you feel calm, and leaves the body quickly once you stop inhaling it. Safe and effective, IV, or intravenous sedation, involves administering a combination of sedative and pain-relieving drugs directly into the bloodstream to induce a drowsy, dream-like state while still being able to communicate. 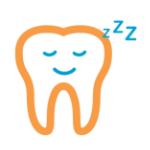 During sleep dentistry, the patient is asleep and completely unaware of what’s going on. If you feel that you are very nervous and cannot relax in the dentist chair, IV sedation would be a suitable option. Comfy Dental Mandurah is one of the few clinics offering this facility in Mandurah. Whether you require a dental filling or are looking for a complete smile makeover, sedation dentistry can help you achieve optimum dental health in the most comfortable way possible. Call Comfy Dental on (08) 9582 8687 or contact us online to discuss your options for sedation and sleep dentistry.